The historical and cultural aspects of the Cold War have been much studied, yet its physical manifestations in England – its buildings and structures – have remained largely unknown. To the great landscape historian WG Hoskins writing in the 1950’s they were profoundly alien: “England of the … electric fence, of the high barbed wire around some unmentionable devilment…. Barbaric England of the scientists, the military men, and the politicians”. Now these survivors of the Cold War are, in their turn, disappearing fast, like medieval monasteries and bastioned forts before them – only with more limited scope for regeneration and reuse. This book is the first to look at these monuments to the Cold War. 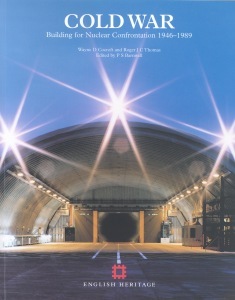 It is heavily illustrated with photographs of the sites as they survive today, archive photographs (many previously unpublished), modern and historic air photographs, site and building plans, and specially commissioned interpretative drawings. It also endeavours look at the installations within the military and political context of what was one of the defining phenomena of the late 20th century.